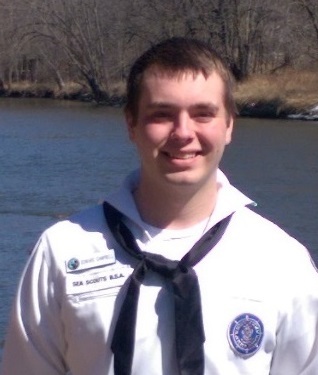 The National Sea Scout Support Committee announces the selection of Edward Campbell of Albion, Indiana as the 2015-2016 National Sea Scout Boatswain. His term of office is June 1, 2015 through May 31, 2016. He is a member of Ship 5111, Patriotic Pearl of the Anthony Wayne Area Council, Boy Scouts of America. Edward will represent Sea Scouts from across the United States as the youth representative on the National Sea Scout Committee. He will report to the National Commodore and the National Director of Sea Scouts. He will serve as the liaison with the Regional Boatswains’ and other youth leaders. Edward earned the highest award in Sea Scouts, the Quartermaster Award. During his tenure in Sea Scouts, he has served his ship as Ship Boatswain, Council Boatswain and currently serves as Central Region Area 6 Boatswain, which includes him running an annual, CR-A6, event called Spring Icebreaker. He is an Eagle Scout; earned his Venturing Silver, all five Bronze awards and the Ranger Award; he is also a Vigil Honor member of the Order of the Arrow. He served as Lodge Chief of his Order of the Arrow Lodge. He is also currently involved in a Varsity Team and serves as Captain while working on his Denali Award. He is working to earn his Venturing Quest and Trust award as well. He is also working on his finals papers for his Venturing Summit award project. He has served Scouting, in many leadership opportunities, as well as others in the community. For ten years, he has been an active member of 4-H, completing many projects over the years. He aspires to take these leadership experiences and earn a degree in Political Science. Edward graduated a semester early from high school with his Academic Honors Diploma. During high school, outside of Scouting, he was an active member of the National Honor Society and a member of the Tennis team where he has earned the IHSAA Sportsmanship award. He aspires to go to the Naval Academy after his year of serving as the National Boatswain. August 1st, he took on a personal challenge to sleep outdoors for 365 days, in a tarp, in an effort to raise funds to help scouts experience the program of which he has been blessed. 100% of those pledges will go to fellow scouts to help them on their Scouting journey. Edward shares his reasoning for wanting to serve as the National Boatswain. His goal is to represent all youth in the program from around the country. His aspirations include expanding the program by helping to guide the formation of additional ships and expanded opportunities for all Sea Scouts. He wants to be the voice of change to help youth see what they can do through the program. He is considered an asset to the program by many who have encountered his involvement. 2015-2016 National Sea Scout Boatswain!